Place kiwifruit and sugar in blender. Cover and blend on medium speed just until smooth. Freeze 1 to 2 hours or until firm. 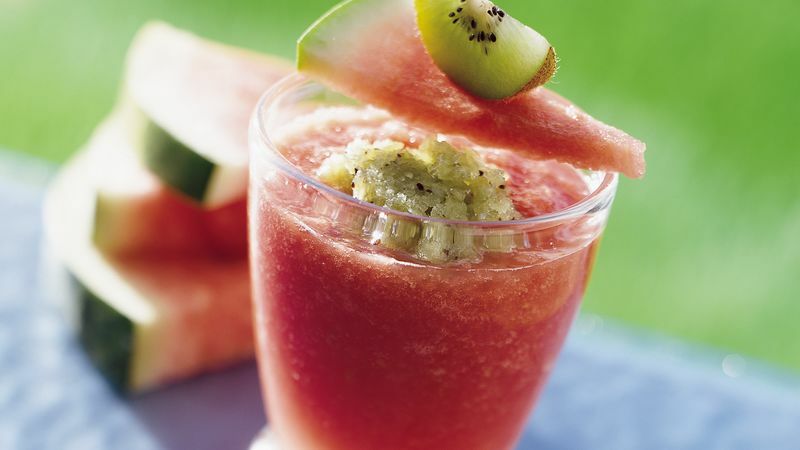 Place watermelon in blender or food processor (blender will be full until blended). Cover and blend on medium speed until smooth. Place frozen lemonade concentrate and water in large pitcher. Add watermelon mixture; mix well. Pour watermelon lemonade into glasses. Spoon dollop of frozen kiwifruit on top. Serve immediately. Blend the watermelon the day before and store in the fridge. Garnish each drink with a slice of watermelon and kiwifruit. If you like, moisten rims of the glasses and dip in coarse sugar crystals, then fill with watermelon lemonade. Don't worry if you find a few seeds in your watermelon. Seedless watermelons actually do have a few seeds; however, they are usually small and edible and will be virtually undetectable by the time you blend the mixture.